If you’re a fitness geek, you’ve probably heard of “refeed days,” a strategy in which you increase your calories — specifically carbs — for a day or so to replenish your energy stores and improve performance and results. It’s a gym-rat favorite that’s been around for years, and there’s no shortage of anecdotal evidence showing that it works. There’s promising research backing up refeed days. Unfortunately, this information gets lost in a sea of incorrect “bro science,” so let’s cut through the clutter and take a look at the real benefits of a refeed day. When you consume carbs, they’re broken down into glucose, or blood sugar. Your body uses this blood sugar as its primary fuel source. Glycogen — carbohydrates that are stored in your liver and muscles — acts as your body’s backup fuel source. While hard exercise is obviously great for you, it also breaks you down. If you add a calorie deficit into the mix, things can get rugged: Those glycogen stores become depleted, your body exists in more of a stress state, and it wears you down mentally. Physically, you can address the situation with proper rest and recovery. Dietarily, it’s a little trickier. Obviously, you can eat more, but if you’re trying to lose weight, porking out to feel better was how you got in this mess to begin with. So you want to be a little controlled about it — that’s where refeed day comes in. Don’t mistake this with a cheat day; on a cheat day, you just go for it and eat a bunch of untargeted garbage. You might get the benefits of a refeed day in there among the excessive fat and sodium, but the additional empty calories and problematic ingredients that come with junk food aren’t necessarily benefiting you. With a refeed day, you’re taking a specific food — high-glycemic carbohydrates — that would otherwise work against your health and targeting them for good instead of evil. The reason for this is that after eating at a reduced calorie level for a while, your body is at a bit of a carbohydrate deficit, particularly with regards to glycogen, the stored form of your body’s primary energy source, glucose. In this situation, when you increase carbs, they go toward replenishing that glycogen, as opposed to being stored as fat. Muscle glycogen, specifically, allows you to push harder during exercise, so when you top off your glycogen during a refeed day, you should be able to push even harder in your next workout. Another benefit of the carb increase is that it feels good to eat yummy food. In fact, high-carbohydrate foods release a “feel good” hormone in your brain called serotonin. 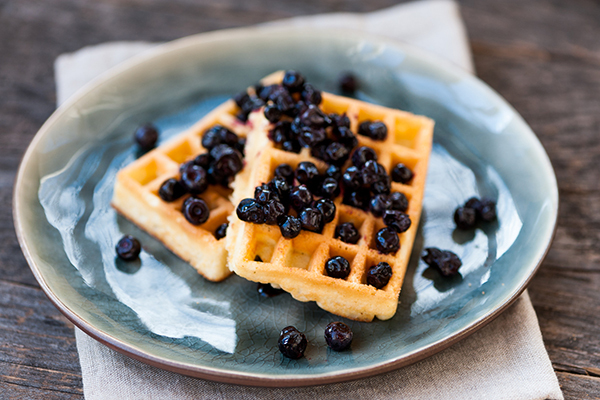 Sure, you could get the job done with plain potatoes sprinkled with wheat flour, but why do that when you can do it with waffles? Psychologically, enjoying the more decadent foods associated with carbs, especially at refeed levels, is a welcome break from the austerity of the rest of a results-driven eating plan. A lot of “bro science” claims that refeed days increase leptin, a hunger-regulating hormone that “tells” your brain that you’re full. In other words, increased leptin is temporary and it doesn’t really impact hunger. Do Any Beachbody Programs Incorporate Refeed Days? Funny you should ask. Our new program 80 Day Obsession does — but with a few modifications. While there are various studies showing successful refeed day timing strategies, there aren’t really any hard and fast rules. When Beachbody Super Trainer Autumn Calabrese wanted to include refeed days in 80 Day Obsession, we kept a number of thing in mind, including her years of experience using refeed days as a trainer and bikini competitor, as well as the available credible science. We fine-tuned it during the 80 Day Obsession test group. The result is what we call a modified refeed day. The modified refeed day isn’t quite as gluttonous as a traditional refeed day. Massive calorie surpluses aren’t for everyone; they can leave you bloated and uncomfortable. What’s more, folks in the test groups still perceived a performance benefit and a psychological boost from a more moderate calorie increase. But the modified refeed day can still seem like a lot of food, so the carbs on these days are high-glycemic — meaning fast-absorbing — so that they digest quickly and don’t leave you feeling stuffed. Also, the fast-absorbing nature of high-glycemic carbs means they also replenish glycogen quickly, making them an asset for your pre-workout meal. When doing a program as challenging as 80 Day Obsession, it’s easy to get swept up in the notion that harder is better. A lot of the time, this can be true; it’s important to do the work and keep that diet tight. But sometimes you just need to take a breath, take a refeed day, and eat the cookie. You’ll be better off for it.